Young Boozer is the 39th State Treasurer of Alabama. He was elected to his first four-year term on November 2, 2010 and was unopposed and reelected for a second term on November 4, 2014. As State Treasurer, Boozer is responsible for the cash management duties of receiving, depositing and investing all state funds, bond management, unclaimed property, two college savings programs and management of the state’s collateral pool for public funds deposits. Boozer also serves on various state-related boards including Alabama’s Teacher Retirement System and Employee Retirement System – Judicial Retirement Fund Boards, the State Board of Adjustment, the Alabama Housing Finance Authority, the Community Service Grants Executive Commission, the Industrial Access Road and Bridge Corporation Board and the 457 Advisory Board. Young J. Boozer, III, was born in Birmingham and raised in Tuscaloosa. He earned the rank of Eagle Scout and received the Distinguished Eagle Scout Award. Boozer received his bachelor’s degree in economics in 1971 from Stanford University and a master’s degree in finance from the Wharton School at the University of Pennsylvania in 1973. During the past four decades, Boozer’s career in banking, finance and investments has taken him from Citibank in New York and Crocker National Bank in Los Angeles, to Coral Petroleum in Houston and Colonial Bank in Montgomery. Boozer is married to the former Sally Jackson of Clayton, Alabama, and they have four children. 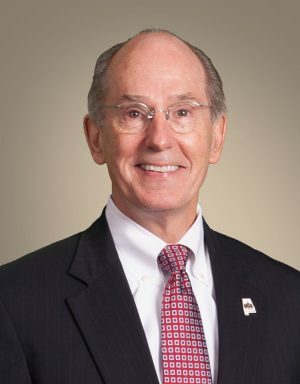 Boozer began his public service career duties as Deputy State Finance Director for Alabama Governor Bob Riley after retiring from banking in 2007. During his tenure in the Alabama Department of Finance, he played a key role in saving millions of taxpayer dollars through the restructuring of state bond debt and derivatives. Boozer left the Riley Administration in early 2010 to run for State Treasurer in his first race for elected office. He is a member of and has held leadership roles in several organizations, including the Church of the Ascension in Montgomery where he served as a member of the vestry, the Montgomery Rotary Club of which he is a Past President, the Alabama Shakespeare Festival where he served as Chair of the Board of Directors and the Montgomery Academy where he served as Past Board President. He is a member of the Montgomery Committee of 100 and a member of the Class of XXIV of Leadership Alabama. Boozer has served in many capacities at his alma mater, Stanford University, including the board of trustees, chairman of the alumni association and was a recipient of the Stanford Medal. Boozer is a member of the National Association of State Treasurers (NAST) where he serves on the NAST Banking Committee. He is also a member of the College Savings Plans Network’s (CSPN) Executive Board and serves as its Chair. CSPN is an affiliate of the National Association of State Treasurers that works to promote and enhance 529 Plans. The CSPN Executive Board is comprised of state officials elected by their peers to serve as the leadership team for CSPN. Since taking office in 2011 the State Treasurer’s office has had many accomplishments including working with the Alabama legislature to pass several bills that have made improvements to treasury functions and overall state government. Boozer expanded the types of investments in which the state treasurer could invest state funds (prior to the passage of this legislation Alabama had the most restrictive investment guidelines in the nation). He freed up $2 million of the state’s general fund budget by moving Treasury’s budget out of the general fund. He implemented changes to the structure and management of the investments of the Alabama Trust Fund that will provide a stable source of revenue to its distribution recipients and provides for long-term, prudent management of its assets for higher total returns. The Treasurer also provided consumer protection and improvements to Alabama’s unclaimed property process. In the 2015 regular legislative session, Treasurer Boozer worked with legislators on passage of the “ABLE” Act (Achieving a Better Life Experience). This will be a statesponsored tax-exempt savings program for disability-related expenses. ABLE will encourage and assist individuals and families to save private funds to support individuals with disabilities to maintain health, independence, and quality of life. Section 529A of the Internal Revenue Code, which codifies the ABLE provisions, is modeled on the immediately preceding Section 529 on which our state’s CollegeCounts 529 Fund is modeled. In addition, treasury staff has been streamlined from 46 positions to 30 while not only meeting, but exceeding established performance levels. A needs-based college scholarship program was established to help first time Alabama college enrollees and pays out approximately $1 million annually to students going to Alabama colleges. Treasury staff now conducts annual meetings with 20 state agencies to review the objectives and performance of their investments that are individually managed by Treasury.